But, before watching the bespectacled young protagonist learn that mothers are prescient (over and over, in a twenty-four-hour period on TBS), you can see the tale of BB guns, bullies, double-dog-dares and dancing girl lamps (okay, just the leg) on stage in Winchester High School’s Auditorium during the first weekend in December. 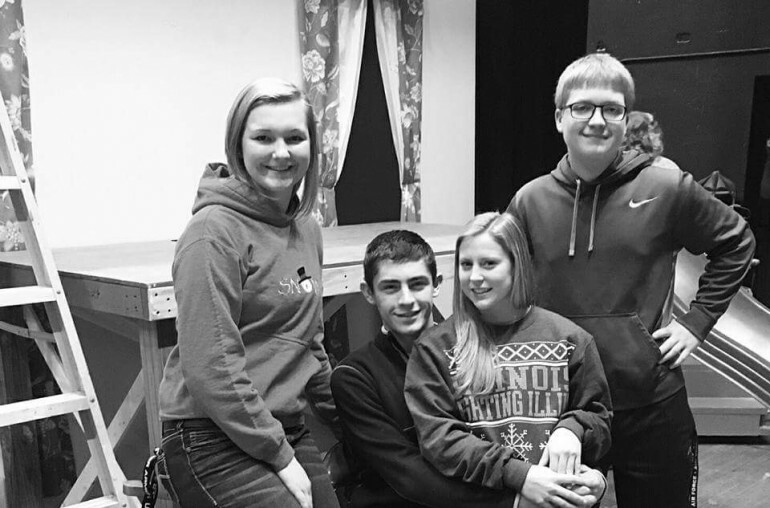 Laura Messenger, Samantha Killebrew and Taylor Lashmett are directing the production, which will be presented Saturday, December 5, at 7 p.m., and Sunday, December 6, at 2 p.m. The cost of tickets will be $6 for adults and $4 for children. Taylor Lashmett was kind enough to answer my questions about the piece. She told me that the cast and crew include 45 kids. This includes Tyler Shipley as Ralphie, the main character who is just trying to survive to his seventh birthday. Noah Sellars and Kait Hubbert play his parents. Michelle Brown has the role of the narrator, who is adult Ralph. Taylor Lashmett told me, on the subject of whether there were any differences between the play and the movie, that many of the scenes from the movie people liked (or, one may suppose, cite) are in the play. The narrative, with which so many are familiar, follows the young Ralphie, all of six years old, through the holiday season. He wants one present his mother does not want him to have because it is too dangerous. What Ralphie thinks is more dangerous is leaving the schoolyard and trying to get home with his glasses — and internal organs — intact, as he is a target for bullies without two quarters worth of sense, but who are imposing. If only he could get this item, at least, his life would be better. Ralphie wants this item for Christmas, and goes through so much to try to get it. The story is based on a part of the book, “In God We Trust, All Others Pay Cash,” by Mr. Jean Shepherd, which is about his youth in Hammond, Ind. (Thank you, Google.) Mr. Shepherd, who went on to be a comedy performer and writer and is cited as an influence for such people as Jerry Seinfeld and Garrison Keillor, helped to write the screenplay for the film. It is also his voice heard as the narrator of the movie. Taylor Lashmett revealed that the large set pieces were among the biggest surprises, as they are bigger than many that the people involved in the production had encountered over the years. She also said that both cast and crew are excited to present the play and happy with the work they’ve done and the opportunity to present it. Which again, they will do in two performances: Saturday, December 5, at 7 p.m. and Sunday, December 6, at 2 p.m. Cost is $6 for adults, $4 for children.